What Is the Sierra Designs Tents Divine Light 1 Fl? Whether you’re out on the trail or hanging at a music festival, a tent can be your perfect home away from home. From ultralight backpacking tents to palatial car-camping shelters, there is truly something out there for everyone today. 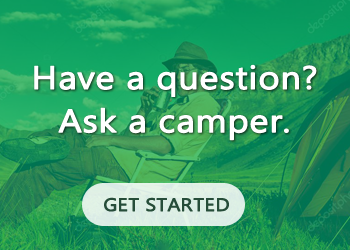 But with so many choices, it can be hard to determine what is the right tent for your needs. In this article, we will look at one of the leading brands in the tent marketplace—Sierra Designs tents. Sierra Designs has been a leading brand in the outdoor space for several decades and is highly respected for quality and performance. 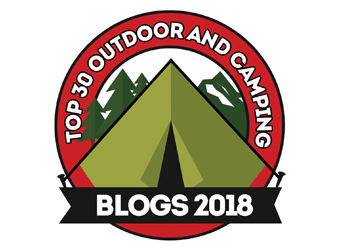 We’ve reviewed one of their current offerings, the Divine Light 1 FL, and also compared this tent to some other models available from Sierra Designs tents. For our review we considered a number of factors to help you choose a tent including product specs, assembly, materials, design, and size. We also chose one overall favorite from our list of Sierra Designs tents. Sierra Designs Divine Light 1 FL is a lightweight three-season tent big enough for three people. It uses a non-freestanding design to help cut weight without sacrificing comfort and space. This is accomplished mostly by ditching a traditional tent pole set up in favor of three small poles and two trekking poles (not included) for support. The Sierra Designs Divine Light 1 FL is one of the roomiest Solo tents available! With 17.10 sq. ft. of sleeping area plus 6.20 sq. ft. of vestibule space that is an incredible 24.4 sq. ft. of protected space. 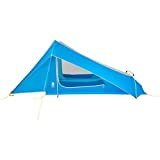 It features 3 windows plus a vent at the foot of the tent for incredible ventilation. All windows have hooded protection so you get plenty of air flow even in the rain. There are 2 doors, one on the side for easy entry and exit plus one at the head of the tent that gives you access to the large vestibule. The vestibule has dual fly zippers that can be unzipped and used as an awning for additional shade or increased ventilation. The awning can also be rolled up and stored if not needed. The Divine Light utilizes 2 vertical DAC NSL aluminum poles, near the head of the tent that give it vertical walls for tons of interior head room. The DAC Pressfit hoop at the rear of the tent gives you ample room for your feet. To save additional weight you can substitute your trekking poles in place of the two vertical DAC NSL poles. All the seams are factory sealed so there are no worries about the weather. It also is equipped with the Sierra Designs Night Glow accessory that turns your own headlamp into a soft diffused light that illuminates the entire tent. It is made of light weight Polyester Taffeta and weighs less than 1 ounce. You simply hang it in the tent, insert your headlamp and instant illumination! Reflective guy lines, DAC J stakes and storage bags also included. Import. * Note - Ultraviolet Light Warning: All tents, canopies, screen houses etc. that Campmor sells are intended for occasional use and not for permanent or season-long use. Continuous exposure will result in damage from Ultraviolet Light. UV damage is not covered by either the manufacturer's or Campmor's warranty.Great 360º ventilation.DAC NSL and DAC Pressfit Aluminum poles.Easy set up non-freestanding design.Dry Entry provided by awning overhang of the front door. The Divine Light 1 FL shares a similar setup to its related model the Tensegrity. Sierra Designs tents are renowned for their simple and efficient setups and this tent is no slouch in that department. Setup begins by staking out the four corners of the tent, as well as the forward awning triangle flaps. Then insert the provided DAC tent poles or two trekking poles into the side grommets and extend them into the peak of the awning. Now you’ll need to stake out the guylines coming off the side awning to provide tension across the tent. Then you’ll insert the curved pole across the back of the tent in the foot box section. Tighten this portion of the tent with the single guyline extending past the curved tent pole. Give each guyline a cinch, tweak the stakes as needed, and you’re good to go. This Sierra Designs tent has two large doors on either side of the tent. Two solidly constructed zippers give tent access in a J formation, and the doors are enclosed with no-see-um mesh. The doors sit below an awning triangle on either side providing 10 inches of weather protection on each side. This could leave some unwanted exposure in high wind and rain, especially for those with down sleeping bags. For most campers, however, the 10-inch awnings will provide more than enough weather protection. The Divine Light 1 FL’s vestibule is one of the star features on this tent. 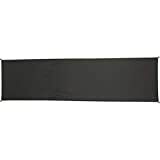 It extends off the front and serves both as gear protection and sunshade in favorable conditions. The vestibule connects to the tent at the top near the peak of the awning triangles. Zippers follow the awning to ground level. The vestibule can also be opened up and extended with trekking poles to create a breezy porch. Gear in the vestibule is accessible from inside the tent through a no-see-um mesh door. The lack of rain fly on this tent drastically increases overall ventilation. While the awnings drop down far enough to cover most bad weather, they also allow lots of cross breeze to circulate through this tent. You can expect some condensation within the vestibule when closed. This is especially true in humid weather. With the vestibule open, however, this Sierra Designs tent is a cool, comfortable shelter. Is This Tent For You? Single wall and non-freestanding tents are not for everyone. Within those categories, however, this tent has universal appeal. It’s easy to set up, spacious, and provides ample weather cover in anything but wet weather with very high wind. 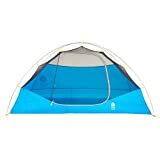 This tent is an ideal option for someone who needs a tent big enough for several adults plus gear, but also wants something light and easy to use. It would be on the heavier side for a true ultralight hiker, but not out of the question. Some general experience setting up tents could be helpful, but the learning curve is low, as with most Sierra Designs tents. Pricing of this shelter is comparable with many of the other Sierra Design tents available today. 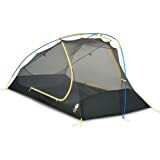 The market on these products tends to fluctuate depending on the season, but this tent currently sells for around $180 to $200 on Amazon. This tent retails for around $180 to 200 via Amazon. This is a middle of the road price point. For a non-freestanding tent, this is a very easy setup. A 30 denier nylon construction should provide all the toughness most campers will need. The Divine Light 2 FL is an excellent balance of great features and lightweight design. This tent would comfortably fit two or three adults. Sierra Designs created this tent in collaboration with National Geographic “Adventurer of the Year” Andrew Skurka. It’s an ultralight three-season tent that could be extended into mild winter conditions. It also features a non-freestanding design and is even lighter than the Divine Light 2 FL. The High Route uses only trekking poles and weighs in at an impressively low 2.5 pounds for both the tent and the shelter. This cleverly designed tent boasts 36 square feet of internal space and a vestibule big enough for two adults’ gear. This Sierra Designs tent currently retails for around $200 to $250 on Amazon. Some may find the trekking pole-only design a challenge. This tent uses a mix of 15D, 20D and 30D premium nylons. A tent this light and packable is worth the added setup time. An interior of 36 square feet is impressive for such lightness. The Sweet Suite 2 is the first freestanding offering in our list of Sierra Designs tents. As a freestanding tent, this shelter includes traditional poles that will hold the structure up without the need for trekking poles or guy lines. This type of tent is typically heavier than a non-freestanding tent, but the Sweet Suite 2 is impressively light. The shelter weighs in at only 3.2 pounds, including the rain fly, and packs down to a tiny 16.5 x 6.5 inches. In addition to being very light and packable, this tent has excellent ventilation. The tent portion of the structure is made almost entirely of no-see-um bug mesh. This not only helps reduce weight but also drastically increases air circulation throughout the tent. This tent currently sells on Amazon for around $350 to $400. Freestanding design makes this easy to pitch in all conditions. The entirely mesh design may sacrifice some durability but drastically increases ventilation. The Sweet Suite 2 isn’t a flashy-looking tent, but it’s super light and comfortable. With a floor area of 29.2 ft2 / 2.71 m2 this tent is slightly smaller than some competitors. The Summer Moon may not be the most technical of Sierra Designs tents, but it could be the most accessible. The manufacturer claims that this tent is the lightest freestanding three-season tent on the market for under $150. Weighing in at a paltry 3.7 pounds fully packed, we think they might be right. 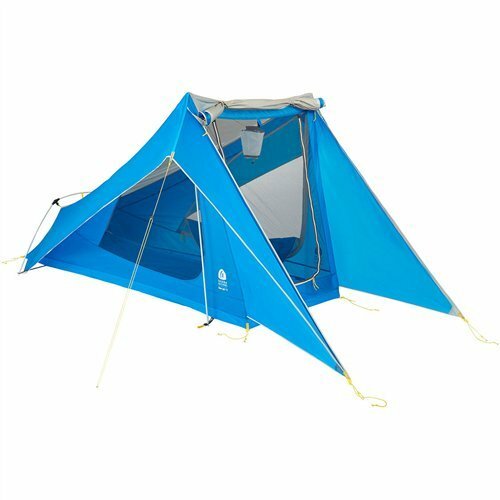 It has a very simple design with just two aluminum tent poles and a single D-sized door. This is a double wall tent and the removable rain fly can be staked out for added ventilation. The fly also has fully taped seams to ensure maximum protection in adverse weather conditions. This may not be the choice for those seeking high-tech features, but its simple and light design will be a great choice for many campers and backpackers. This tent is currently available through Amazon for around $130 to $150. Super simple freestanding design will appeal to new campers. The 68D Poly Taffeta will provide nice protection but won’t hold up as well as some other materials. This is a simple, solid design that will appeal to most users. With a floor area of 29.2 ft2 / 2.71 m2 this tent has plenty of space for two people. Sierra Designs tents are some of the finest quality camping and backpacking shelters on the market today. As a brand, Sierra Designs has gained a reputation for not only elite level quality but also innovative designs in all of their products. Their Divine Light 2 FL tent is no exception. The choice between a freestanding and non-freestanding tent can be challenging when making the investment in such an important piece of gear. With this tent, however, we feel you’re getting the best of both worlds. The Divine Light 2 FL has the guts of a non-freestanding tent but the setup is so simple that it’s almost like a freestanding tent. The included side poles and rear pole couple seamlessly with your trekking poles and make this tent a breeze to assemble. You’ll want to give it a few practices turns before heading into the backcountry, but we find it more intuitive than many other non-freestanding tents. This is not the lightest non-freestanding tent out there, nor even the lightest of the Sierra Designs tents we reviewed. That said, they put the weight back in where it counts by giving tons of space both inside the structure and in the vestibule. The overall product is a big, comfortable space that will keep you dry in the rain and cool in the heat. 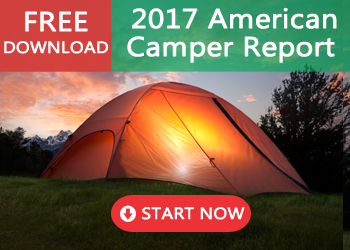 Our Top Pick: From the range of Sierra Designs tents that we reviewed our top choice was the Summer Moon 2. This tent can’t be beaten for versatility and value. At around $130 it’s a tent that most any hikers and campers can afford, but it’s also as light as many tents at a much higher price point. It lacks some of the bells and whistles on other Sierra Designs tents, but sometimes simplicity wins out. This tent could be an ideal choice for a scout just starting out their hiking career or a seasoned veteran heading off for a backcountry trek.